Biota Max™ are concentrated effervescent tablets. In the same way that a bag of seeds, will grow a truck load of produce, bacteria and fungi spores germinate and grow rapidly! One Biota Max™ tablet contains the bacteria and fungi spores to treat your entire lawn and garden, up to 1/4 acre (1/10 hectare). FREE SHIPPING!!! EMAIL for large volume DISCOUNTS! Biota Max™ is also available in Farm Quantities! Free Shipping applies to USA only. For International Shipping Rates, please email for quote. Mushroom Growers email for mushroom specific product! 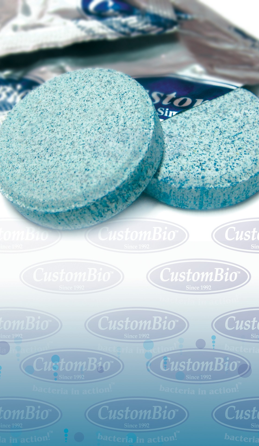 CONTACT CUSTOMBIO! REQUEST DISTRIBUTOR INFO! This page and its contents are copyright 2009, 2010, 2011, Custom Biologicals, Inc.
All application instructions and graphics are copyright 2009, 2010, 2011, Custom Biologicals, Inc.
CustomBio and Fizzytabs are Trademarks of Custom Biologicals, Inc.
Biota Max and Biota Max Fizzytabs are Trademarks of Custom Biologicals, Inc.
CustomBio product names are all Trademarks of Custom Biologicals, Inc.